Flash cards are popular storage cards used to store various kinds of digital media. They have been considered a very safe and secure way to effectively store data. MMC Card, short for a multimedia card, is also a type of Flash Card that is in a simple solid state. It stores digital media easily. You can store a variety of photos, music, videos or any other kind of files or documents on it. Though it can be found in many devices, most commonly you can find it in a mobile phone. What if you have accidentally deleted data from your Multimedia Card and want to retrieve it? On the other hand, what if due to a system failure all the data on your Multimedia Card is lost? Any virus infection can also cause the loss of data on your Multimedia Card. In such cases, many times you lose very important data. However, there is a way around this problem. You can actually recover this lost data using Multimedia Card Data Recovery software that will scan and find your lost files. Not just that, it will also help you recover the files you wish which include images, videos, audios and even documents and files. 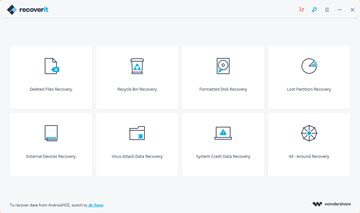 You can easily recover your lost data through a very simple software that is considered one of the best options to recover lost data from MMC Cards with Recoverit Data Recovery Tool. It is a very safe and secured way to recover data from your Multimedia Card along with various other memory cards, storage devices and it also works effectively on external hard drives and computers. The MMC card recovery software can recover lost videos, images, audios, documents, emails and other important data. Connect your Multimedia card with your computer or other device and wait for it to be recognized. 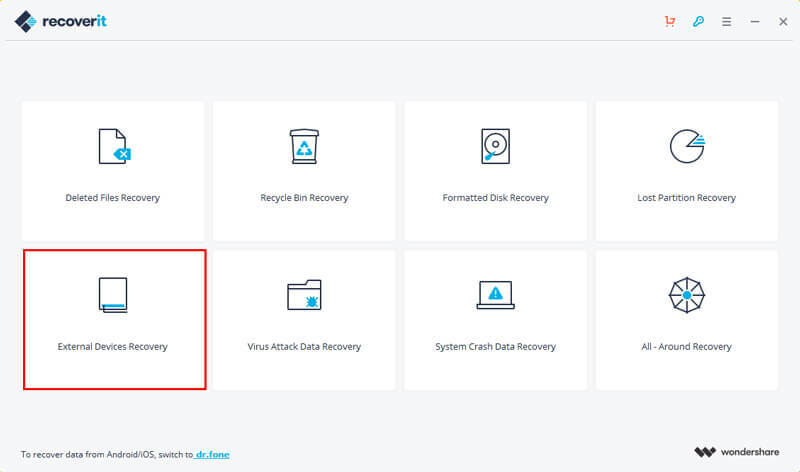 Install and open the Recoverit Data Recovery Tool and follow the next simple steps to perform mmc card data recovery. To recover data from MMC card, you can go to select the option "External Devices Recovery" to get started. Make sure your MMC Card connected to the computer. All the recognized devices and multimedia cards will be displayed and you need to select your multimedia card. Click "Start" to scanning lost files. 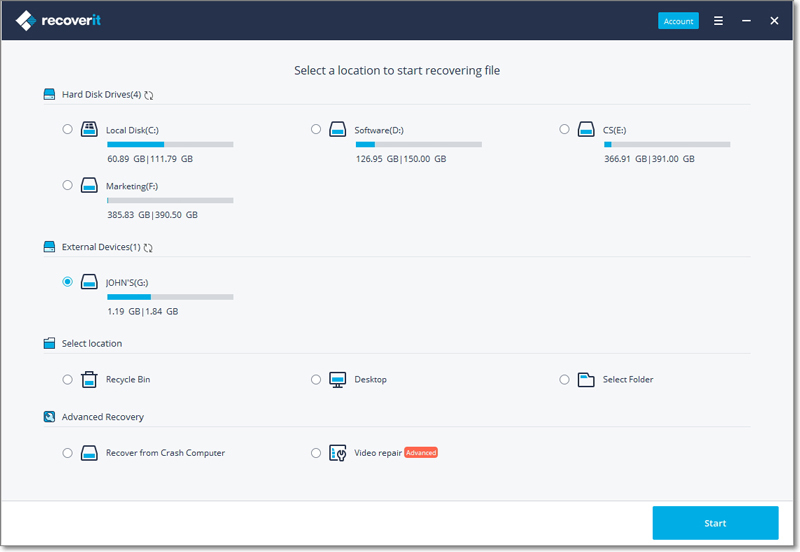 If quick scan can't find your lost files, you can go to deep scan with "All-around Recovery" mode which will search more files and take more time. Recoverit Data Recovery software will scan the multimedia card and provide you with results in the form of all the lost files. You can check and preview each of them and see which ones you need to recover. Once you are sure about each file, just click on the recover button and the files will be saved on your card. Cannot recover my files using this program? The user guide given above for Recoverit Data Recovery software is for the Windows version and this may be a reason why you cannot recover your files. In addition, different versions of the software are compatible with different devices and so you must find which version suits your device. Whatever version you choose, mostly all features remain the same. The biggest advantage of MMC Cards is their high storage capacity that allows you to store a lot of data without hampering the quality of the data. You do not need to carry multiple cards and switch data on it instead; you can have a lot of data on one single card. Multimedia Cards have a very high speed of data transfer and you can easily transfer data smoothly over several devices. The speed of transfer is not affected by the amount of data to be transferred. Multimedia cards are expensive as compared to the other cards and you should always check if you require a multimedia card before purchasing one as it might be useless. The huge space is a good bonus but not many require it. A multimedia card, if infected by a virus, may lead to loss of all data. In such cases, it is better to have the data backed up already or to have your data stored on smaller cards instead.